What I would like to do is to brag about my newest, greenest award. Once again, the bottle fermented Hampshire Heritage has won a prize at the Big Apple Cider Trials in Putley, Herefordshire. This time it is a third place. Whilst 'award winning' cider producers are two a penny these days - and 3rd place isn't exactly winning - it IS a useful measure that the standards are being upheld or even improved... and that is good for reputation and the drinker. After all, I want to continue to grow 146 Cider and the only way to do it is in a way that ensures quality and standards are kept as 'the same' as I possibly can! So - 3rd out of 18 bottle conditioned ciders isn't bad... it will be available to buy this year too (though in limited numbers!!!) Look out for OneFourSix Reserve!! As a blend, Thornleigh Estate cider is a blend of two traditional cider varieties of apple, Kingston Black and Michelin. Kingston Black is renowned as being the best variety of apple to make a single variety from. It is a mild bittersharp apple with plenty of flavour to go with the (reasonably) balanced tannin and acid. Pitched with this is Michelin; a very under-rated mild bittersweet apple with a much less dominant profile. Both of these apples were sourced from Hinknowle Orchards in Dorset. Why? Because I feel that Kingston Black is more acidic than I would like as a single variety and blending it with another mild apple will not destroy the best bit… the taste. I am very pleased to say that the experiment has worked well. 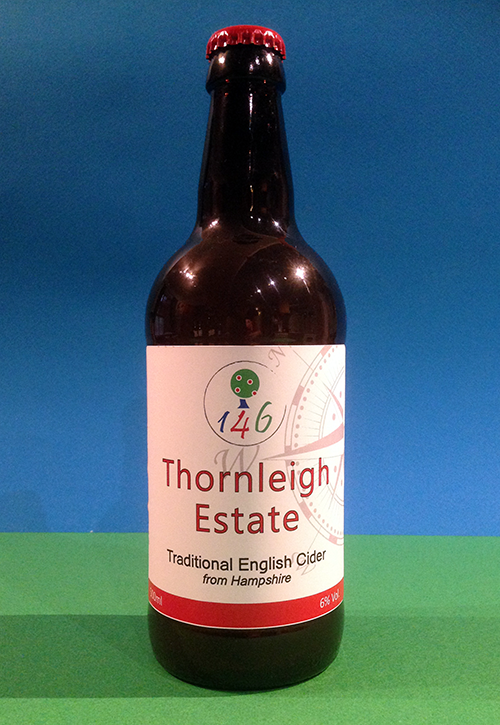 The name ‘Thornleigh Estate’ is a bit more local – the place where 146 Cider is was build as the Estate Managers house for the Thornhill Park Estate in the 1870’s. Now simply known as 146, it still retains its original name of Thornleigh. I wanted to reserve this name for a special cider… and I think this is it. Hampshire Perry = Again, a truly Hampshire sourced and made perry, why call it anything else!